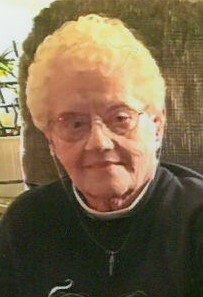 DELPHINE A. MARSZAL (nee Kosicki), age 85; beloved wife of the late Leonard; devoted mother of Jim (Stephanie), Gary (Cindy) and Jeff (Mary); cherished grandmother of Katie (Brandon); loving daughter of Anthony and Helen (both deceased). Delphine always enjoyed spending time with her family, their canine companions and looked forward to following her beloved Cleveland Indians. Friends may call at GOLUBSKI DELIBERATO FUNERAL HOME 4747 TURNEY RD. CORNER of GARFIELD BLVD. FOR VISITATION ON FRIDAY, MARCH 22, 2019 FROM 4:00-8:00 PM. Prayers will be held at the funeral home on Saturday, March 23, 2019 at 9:30 am followed by a Mass of Christian Burial at St. Therese Church at 10:00 am. Interment All Saints Cemetery. Online condolences may be submitted at www.GDFH.net.